Udinese summer signing William Troost-Ekong has tipped international teammate, Torino's Ola Aina to be a success in the Serie A and has revealed that Super Eagles captain Obi Mikel has the qualities to play for all the top teams in Italy. The central defender is expected to recover from injury to make his fourth straight start in the league when Torino visit Udine on Sunday. 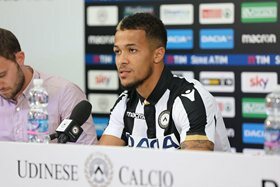 Asked which Nigerian player would do well in the Serie A, Troost-Ekong told fantagazzetta.com : ''I really like a player who already plays in Italy, and it's Ola Aina, who has moved from Chelsea to Torino. ''He is an excellent fullback and has all the qualities to do well in Serie A. Who I would want to see in the Italian championship is John Obi Mikel. ''He ( Mikel) is a great player and I think he could play in all the teams of Serie A and would make Italian football fans happy with his qualities''. Mikel had been linked with possible moves to Inter Milan, AC Milan and Juventus before he joined Tianjin Teda from Chelsea in January 2017.